1 What Is an Office Chair? An office chair is an extremely common type of seating most commonly featuring a padded chair back with lumbar support, a padded seat, set on casters, allowing it to roll and swivel. They’re frequently height-adjustable and are often referred to interchangeably as a desk chair or computer chair. As the name implies, office chairs are used in a work or office setting, but this doesn’t mean that corporations are the only places they’re found. Given the ubiquity of computers, almost everyone who has a PC in their home has an office or computer chair sitting in front of it. It just makes sense. No other type of chair commonly found in the home is well-suited to computer work. If you’ve ever tried sitting in a straight-backed kitchen chair, or a recliner and used your computer, you know how awkward it can be. Use a kitchen or dining chair, and your back will be killing you in short order. Sit in a recliner and use your computer for more than a couple hours, and you’ll start to experience neck pain. The office chair is the only one that makes sense, and fortunately, there are a vast number of types of computer chairs to choose from. With so many different types of office chairs on the market today, there’s something for every taste and preference. 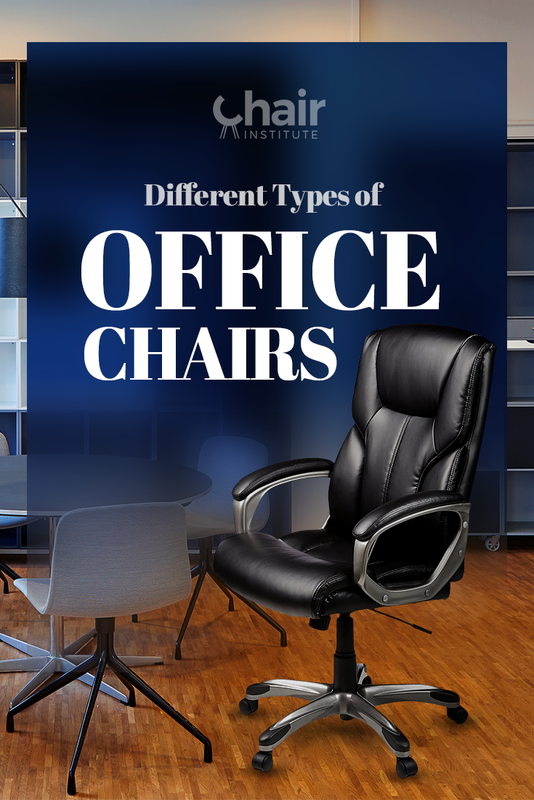 We’ll outline the major types just below, and at the end, we’ll display the different types of office chairs with pictures. This is more a seating subclass, but it deserves mention here. Any of the types of desk chairs made today can be purchased in a big and tall variant. These chairs are distinguished by being physically larger, capable of supporting users up to 6’6” tall, and being fashioned of studier materials of extra thickness. Their other traits are informed by the particular type of chair. As the name suggests, these chairs are designed for use in a conference room. Meetings and conference calls can run somewhat long, but at the outer edge, you can expect to spend no more than three or four hours at a ﻿stretch in them. As such, they have inferior ﻿lumbar ﻿﻿suppor﻿t when compared to some other models. Of the various types of computer chairs sold, these then, make a relatively poor choice for day to day long term use. They had the advantage of being somewhat cheaper, so if you only plan to be sitting at your desk for no more than half-day increments, this could be an excellent choice. As the average length of the workday increased, and more and more people began spending more time sitting, the realization dawned that chairs with additional support were needed. Ultimately, this is what spawned the ergonomic movement, which saw the creation of office chairs with much better lumbar supports, fostering better overall posture. If you spend several hours a day sitting in front of your computer, then you need a chair with ergonomic supports. You’ll pay more for it, but the extra money will save you doctor and chiropractor bills. These are hands down the most expensive of the various types of desk chairs sold. They’re high end, with better padding for added comfort, and most of them feature a full range of ergonomic features. If you’re buying one for home use and can afford it, spend the extra money and buy an executive chair. Not only are they better looking from an aesthetic standpoint, but they’re also more comfortable and tend to combine all the best features from other types of chairs. While there aren’t actually multiple subtypes of office chairs, it is true that they come in quite a number of varieties. For instance, just like with regular office chairs, you can find executive chairs in “big and tall” and petite sizes. Mostly though, executive chairs are defined by a robust set of features. In addition to the above, a small minority of executive chairs will come with “extra” features like massage heads or a recline function. It’s possible to find an executive chair with any combination of these features, which gives you the ability to find the perfect executive chair for you, complete with all your favorite features. These are a necessity in any office that has a waiting room or reception area but are not recommended for anything other than incidental, short-term seating. They’re reasonably comfortable, but lack the support necessary for extended use. These chairs aren’t widely used in most offices, but they do offer some compelling advantages. If you suffer from chronic back pain, these are an excellent choice. Unfortunately, they’re not all that comfortable, which means that if you have to be in your chair for several hours at a stretch, they can be exhausting to sit in. For stints no more than four hours at a time, though, they’re a great solution. As with big and tall chairs, this is more a seating subclass, and like big and tall chairs, any of the types of computer chairs sold today can be ordered in a petite variant, which is smaller, lighter, and constructed of thinner materials, optimized for physically smaller people. Also like big and tall chairs, their other defining features are informed by the specific type of chair. Cheap and easy to mass produce, stacking chairs are typically pulled out of the storage closet any time there’s a dinner or company-wide meeting when mass-seating is needed for a short period. They’re not terribly comfortable but will serve in a pinch. This is not something you want to buy for home use, but they certainly have their place in the office seating ecosystem. In recent years, ﻿ergonomic ﻿stool﻿s have exploded onto the office scene. It’s an interesting seating option, but not for everyone. While they do foster better posture and are ideal for short to medium-term seating, if you spend several hours at your computer at a time, like ergonomic stools, these can be exhausting to sit in. These are inexpensive, moderately comfortable chairs that tend to have a limited feature set. They’re excellent for short term seating (1-3 hours at a time), but more than that, and their lack of posture support features will make them increasingly uncomfortable. Ideal for corporate use, these aren’t a great option if you’re self-employed and working from home. If that describes your situation, then you’re better off, by far, to spend the extra money and get something more robust. This list, although fairly extensive, doesn’t do the category justice. Among each of the different types of chairs in office category, there are literally dozens of subtypes offered by a wide range of manufacturers. For example, some offices use exercise balls for seating, and you can even find chair frames with a mid-back back support with space for an exercise ball where the seat would go. There’s even a recent trend to forego the seat altogether, which has led to the creation of the standing desk. “Sitting is the new smoking,” as the saying goes. In addition to that, most of the chair types can come in either mid-back or high-back varieties (mid-back variants tend to be less expensive) and tend to be made with either mesh, cloth, or leather upholstery, giving you virtually unlimited choice. Before the Industrial Revolution, people who worked in offices either sat on simple stools or more typically, Windsor chairs, pulled up to their desks. Wealthy homeowners had what were essentially padded Captain’s chairs, larger and more ornate than what you’d find at the head of a dinner table. Charles Darwin (yes, that Charles Darwin) changed all that when he mounted his desk chair on rolling casters so he could more quickly and easily access his research notes and materials. Otto von Bismarck, the First Chancellor of Germany, popularized them by distributing them to every member of parliament while he was in office. Stateside, the office chair went mainstream in 1851, thanks to Thomas E. Warren, who invented the Centripetal Spring Armchair. It was a groundbreaking invention, and all of its elements survive to this day in modern office chairs, including a height adjustment feature, lumbar support, and rolling casters to facilitate ease of movement. In fact, this design included a feature not found in most office chairs today. Tilting, courtesy of four large steel springs that the seat rested on. This feature disappeared for decades and has only recently begun making a reappearance in the most modern office chairs being made and sold. Unfortunately, Warren’s design was not well-received outside the US. During the time the chair was in production, Europe was in the grip of Victorian morality, and their seating customers reflected this. As strange as it seems today, back then, Europeans preferred uncomfortable seats with no back support because it allowed them to display their discipline, willpower, and refinement. It was a point of pride, you might say. Advances in materials science and a better general understanding of human anatomy in the 70’s led to the development of the ergonomic chair, which spread quickly through the office ecosystem. As more and more people spent more time tied to their chairs, the shortcomings of the original design became apparent, and more advanced supports were needed. In recent years, there’s been a flurry of activity and advancement in the office chair ecosystem leading to a corresponding explosion of different types of desk chairs.